Many couponers like to buy coupons from coupon-clipping services or through eBay. It allows them to get the coupons that they know they will use, find multiple coupons for the same items and have access to many coupons that they may not get locally. "Coupons are non-assignable and are void if transferred, bought, sold, traded, exchanged for cash, other coupons, or certificates, or auctioned, from their original recipient to any other person, firm, or group prior to store redemption, or if photocopied, reproduced, or altered in any way." Because most all manufacturer coupon redemption policies clearly state that buying and selling coupons voids the value of the coupon, there is no legitimate way to sell coupons that have value. The actual term for redeeming a purchased coupon is "redemption fraud," yet there are numerous websites where shoppers can order the coupons that they want, despite the clearly-stated redemption policies. So how do they get away with it? What the owners of the coupon-clipping websites claim that they are selling is their service, not coupons. The service fees cover their cost of maintaining the website and clipping, grouping, managing and mailing the coupons. The costs can range from under a dollar to monthly subscription rates. There is no type of legislation that I know of that says this kind of service is illegal. However, what the Federal Trade Commission states is, "Selling or transferring coupons to a third party violates most manufacturers' coupon redemption policies -- and usually voids the coupon." Therefore, selling the service or buying from the service does not appear to be illegal, but the coupons that are mailed out are void and have no value and should not be redeemed. Technically, by using the coupons, some couponers are getting money for something that no longer has value. Most people that go to the expense of using coupon-clipping services or eBay are going to use the coupons that they have purchased, and it is doubtful that most cashiers will know if a coupon was clipped at home or bought through an online service. But for those who are concerned with what is ethical, the answer is clear -- buying and selling coupons is not ethical. eBay used to attract a lot of coupon resellers, along with many who were selling counterfeit and stolen coupons. In 2015, eBay restructured its policies regarding coupon auctions. Today, people selling coupons on eBay are not permitted to sell the labor it takes to auction off a coupon. Under eBay rules, the coupons themselves are the items being sold. There are also limits on how many coupons a single seller can sell. Today, eBay sellers can only sell up to $100 or 25 valid, unexpired, original coupons per month. The allowed 25 coupons per month include multi-quantity listings. eBay includes a warning to buyers that retailers may refuse to accept coupons that have been purchased "in a way that violates the terms of the coupon." Prior to enforcing the stricter policies, eBay was averaging over 100,000 coupon auctions a day. That amount was reduced by 96 percent within the first year. Why do manufacturers or stores care if people buy coupons when the people are going to use the coupons to buy their products? Stores and manufacturers benchmark a certain amount of money for coupons and how and where they are distributed is based on extensive market research. For example, a company may want to test the amount of a coupon promotion within a limited area. It will then make future promotional determinations based on the results. If someone collects multiple coupons and then sells them to people in other areas of the country, the test fails. The company may then be forced to redo the test at additional cost, or scrap future distribution of the coupon, which ultimately hurts shoppers. Stores and manufacturers want to keep control over the coupons that they distribute. It is wrong for couponers to ignore the redemption policies and it could result in companies cutting back on consumer coupons. "Buying coupons: When a person buys coupons, they may be inadvertently purchasing stolen property or counterfeit coupons. Even if there is not a direct criminal penalty involved, both coupon buyers and sellers open the door to potential litigation when they buy or sell coupons because they are in violation of the "nontransferability" clause printed on all coupons distributed within the United States. The transfer makes a coupon void. 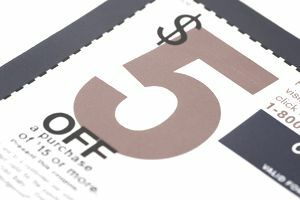 Coupon sellers often include legal disclaimers stating that they are selling their time, a service, or even envelopes that just happen to contain coupons instead of the coupons themselves. Such statements are invalid and do not offer any legal protection. Rather, such statements suggest that the sellers know that their coupon sales are inappropriate and wrong." The internet is a great source for couponers to find coupons. It is also a favorite source for criminals who sell stolen coupons. This puts buyers at risk of not only buying stolen or counterfeit coupons, but also sharing their credit card numbers or bank account information with thieves. It does not mean that every website advertising coupon clipping services or auctioning coupons is made up of criminals. On the contrary. Most of the people in the business of selling or auctioning coupons have studied the laws and added disclaimers to their websites that keep them well within the legal boundaries of the law. But it is important that buyers know the risks of buying coupons online. There is an abundance of coupons that you can find that are free and do not test the terms of the manufacturers' redemption policies. Ignoring the policies ultimately hurts all couponers in tighter controls and fewer coupons being distributed.